The key to home security? Purchasing the best lock for your place, lifestyle, and budget! Good home security starts at your front door. A home burglary occurs approximately once every 18 seconds in the United States, and thieves prefer homes that are easy to enter. A deadbolt—so called because the locking bolt is nonmoving and can only be operated by manually turning the locking mechanism with a key or a thumb-knob—offers the best security for most entry doors. Not all deadbolt locks are the same, however. They range in quality, price, and the level of protection. If you’re ready to upgrade your home’s first line of defense, read on to understand what makes a lock the best door lock and consider our top three picks. several different designs to choose from—and not all are ideal for the typical house or apartment. • Single Cylinder Locks: A single cylinder lock opens with a key from the outside and operates inside by turning a thumb-knob. In addition to the exterior key hole, some newer single cylinder locks feature a keypad that permits residents to enter a numerical code to unlock the door. A keypad makes it handy for family members who wish to avoid fumbling for keys in a purse or pocket. A simple single-cylinder deadbolt starts around $25 but can cost $100 or more for a high-end model in bronze, solid brass, or the inclusion of a keypad. • Double Cylinder Locks: Like the single cylinder lock, a double cylinder lock opens from the outside with a key, but instead of a thumb-knob, the same key is used to lock and unlock the door from inside. Double-cylinder locks offer break-in security on entry doors that contain glass windows, since an intruder cannot break a pane and then reach in to unlock the deadbolt because there is no thumb-knob. Local fire codes often ban these locks, however, deeming them a hazard should a home emergency occur and residents need to get out quickly. Double cylinder locks cost between $25 and $50, depending on brand and quality. • Vertical Locks: Also called “jimmy-proof locks” for the additional security they provide, or “Segal locks,” after the company that designed and first manufactured them. This type of lock employs a vertical bolt that extends through a set of rings to secure the door. The strike plate (the metal plate that attaches inside the door frame—see below for more info) features steel rings that interlock with additional steel rings on the lock itself when the door is closed. 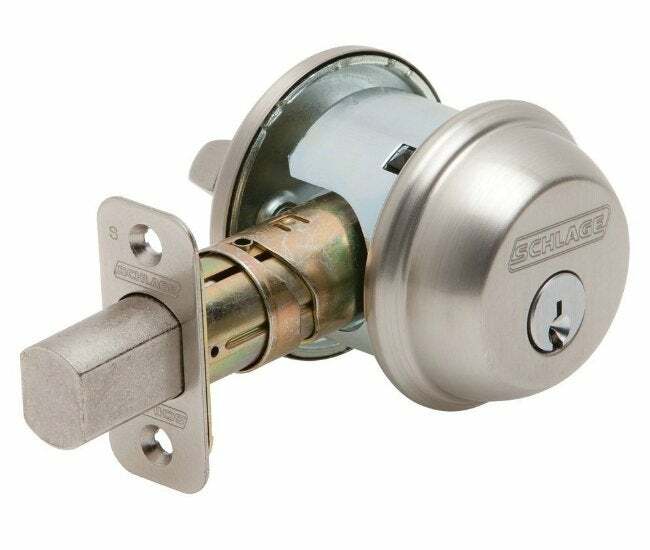 Vertical locks can incorporate either single cylinders or double cylinders and are most commonly used in commercial applications, such as hotel doors or large apartment complexes. • Smart Locks: As technology advances, so do ways of securing our homes. Smart locks, which use your home’s Wi-Fi network to send and receive information to your phone or PC, may be operated by voice control, from your smartphone, or by fingerprint recognition. In addition to locking and unlocking your door, some smart locks feature motion-activated cameras to record all visitors at your door. They range in price from $200 to $300. bolt extends into a hole in the strike plate. Inexpensive locks may come with flimsy strike plates that bend easily when the door is kicked. 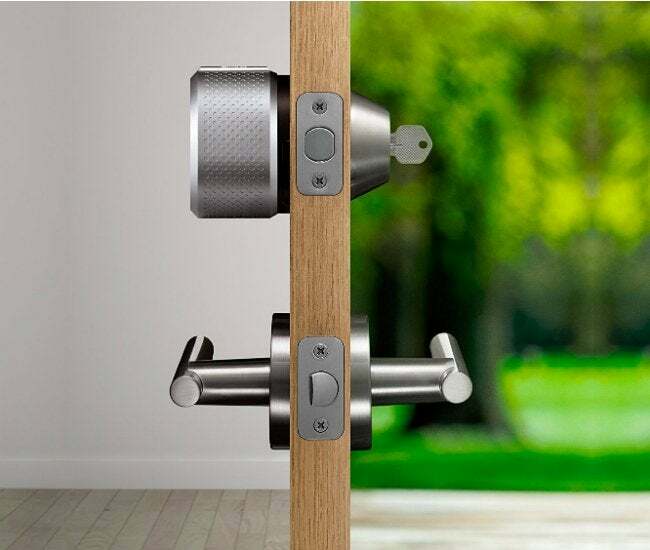 Look for quality locks that come with reinforced strike plates for better protection against a would-be intruder. The rating issued by the American National Standards Institute (ANSI) can help homeowners suss out the strongest door locks available. Locks are given a grade rating of 1, 2, or 3 based on a lock’s durability and its potential to withstand attempted forced entry. making Grade 1 locks for residential use. • Grade 2: Many locks found on today’s homes are Grade 2 locks. They feature high-quality steel construction and are designed to deter most attempts at forceful entry. Unless you have high-security needs, a Grade 2 lock is probably sufficient. • Grade 3: While a Grade 3 deadbolt still offers a measure of protection, it may contain substandard components that will not hold up to a determined intruder, and it won’t last as long as a higher quality lock. Most residential deadbolt locks, no matter the type, fit the standard pre-drilled hole in an exterior door, so installation is a DIY-friendly endeavor. Quality locks often come with 3-inch screws for attaching the strike plate to the door frame. If your deadbolt’s screws are shorter, it’s wise to purchase 3-inch screws separately and use them in place of the shorter ones, which won’t embed deeply enough in the wall framing that lies behind the door frame. The longer screws will make it more difficult for an intruder to kick the door open. 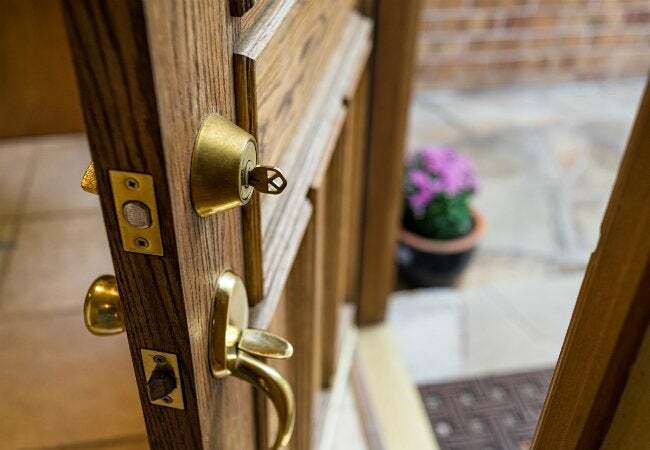 After thoroughly comparing door lock reviews from consumers and publishers alike, we’ve rounded up three of the most highly rated models available today to help you find one that fits your home’s needs and your family’s budget. Check out the best door lock options below! Considered the “best lock for most people’s front doors” by The Sweethome, the Schlage B60N Single Cylinder Deadbolt is an affordable yet highly secure Grade 1 deadbolt. It comes with an anti-pick shield, an oversized bolt, and a reinforced strike plate for increased kick-in resistance. Amazon customers award the Schlage deadbolt 4.5 out of 5 stars, citing ease of installation and smooth operation. Like other single cylinder locks, the Schlage accepts a key on the exterior and features a thumb-knob on the inside of the door. The thumb-knob is large and simple to turn, qualifying it for Americans with Disabilities Act (ADA) status. It comes with a limited lifetime warranty against mechanical and finish defects. Available from Amazon. Consumer Reports‘ testing found this lock to excel for superior resistance against kicking, lock-picking, and forced entry from attempted drilling of the lock. This certified Grade 1 lock features solid brass construction, high-tensile steel mounting screws, an oversized, hardened steel bolt, and a secure reinforced strike plate. The deadbolt fits a standard entry door hole, making installation DIY-friendly. 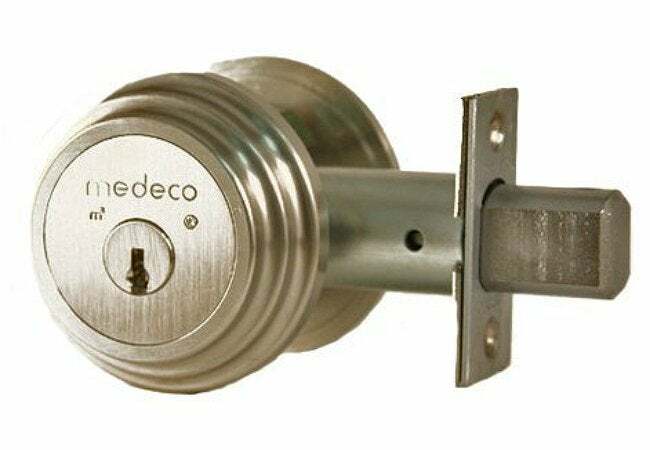 Amazon customers give the Medeco Maxum a hearty 4.3 out of 5 stars, noting appreciation for the peace of mind that comes with a high-security deadbolt lock. Though a little pricier than other standard single cylinder locks, it’s certainly a top-quality deadbolt sure to last for years, and it comes with a 2-year warranty against factory defects. Available from Amazon. The August Smart Lock 2nd Generation won the Editor’s Choice award in independent testing by tech-savvy site PCMag.com for its “easy installation process, user-friendly app, and overall smooth performance.” The August Smart Lock works with an existing deadbolt instead of replacing it (hence no ANSI grade rating), installing on the inside of the door and replacing the thumb-knob on a single cylinder lock. The lock monitors each time the door opens and closes, and it can be configured to send notices to a smartphone. Through the use of separate apps, the lock can operate using voice commands. The August Smart Lock also utilizes “geofencing technology” to unlock the door when you approach from the outside if you’re carrying your smartphone. The August Smart Lock, which Amazon customers gave 3.5 out of 5 stars, is compatible with Apple’s phone, TV, computer, and tablet products and requires downloading one or more apps in order to install and run some advanced features. At present, it does not work with Android-type devices. The August Smart Lock comes with a 1-year limited warranty against defects. Available from Amazon.